PAINTED ROCKS – LIZ’S AND more!!! If you do not already paint rocks, you might not want to read any further. Painting rocks is addicting, enjoyable and medicinal. It all started when my lovely daughter in law showed me her collection of artful rocks she had been painting, I was hooked. She leaves her painted treasures everywhere she goes, especially when she is traveling. The strategically placed rocks are for people to find, post the find on face book, move the rock to another location, or just keep for their enjoyment. I then at her suggestion joined through Facebook Bend Rocks and RV Rocks (its Free). 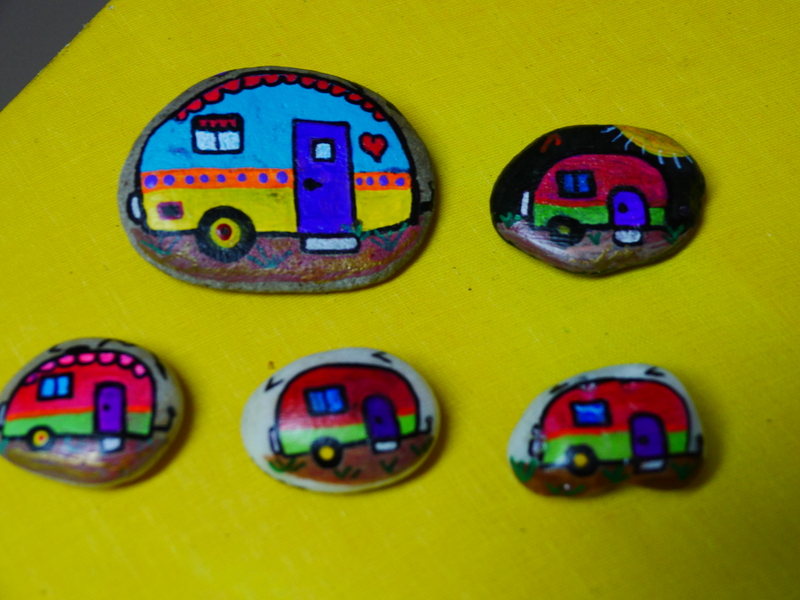 So far I have painted about 40 rocks and only left 5 as they are so cute it’s hard to leave them,. I have to work on that.HA… As I travel, I will also be leaving my creations and hopefully you find them along your way. Here is an example of Alicia’s (daughter in laws) artful rocks.